Today’s currency in play is unquestionably the UK Pound. 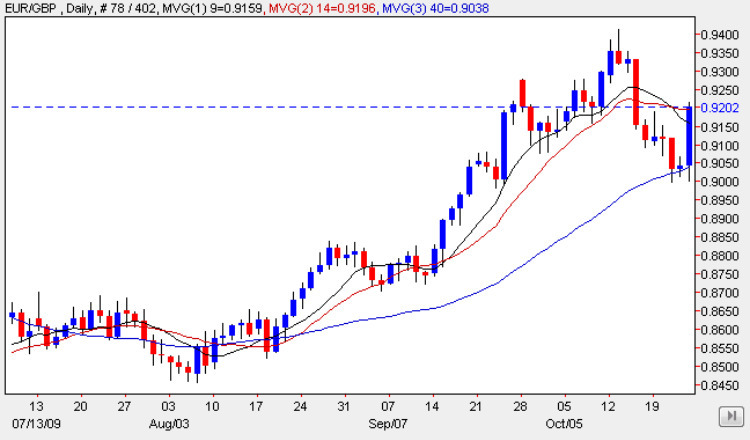 The currency is still reeling after Friday’s UK GDP data unexpectedly showed that the UK was still in a recession. Currency traders hit the sell button, causing huge reversals on the GBP/USD, GBP/JPY and EUR/GBP. There has been some follow on selling in early trading and the hot money is betting that the pound has further to fall. Meanwhile economists are divided on what Friday’s GDP data means with some arguing that the data could be revised upwards. The result is that Sterling is likely to be volatile and overreact to any UK economic announcements, so this evening’s speech by MPC members Posen could have an exaggerated effect on the forex markets. It could idea to wait until this speech before placing any bets on the pound. The biggest beneficiary of the pound’s collapse appears to be the euro which is also making good gains against the US dollar. Aside from the euro, the ‘commodity’ currencies of the Canadian and Australian dollar are also well placed for a rally this morning as oil nudges back towards $80. Early indications are that it will be a positive start to the week for world stock markets like the FTSE 100 and Dow Jones (Wall Street) after a good session from Japanese stocks. The best moves could come from the pound again today with the EUR/GBP potentially the best place to bet.